A recent trip to Salvation Army was a bit disappointing. 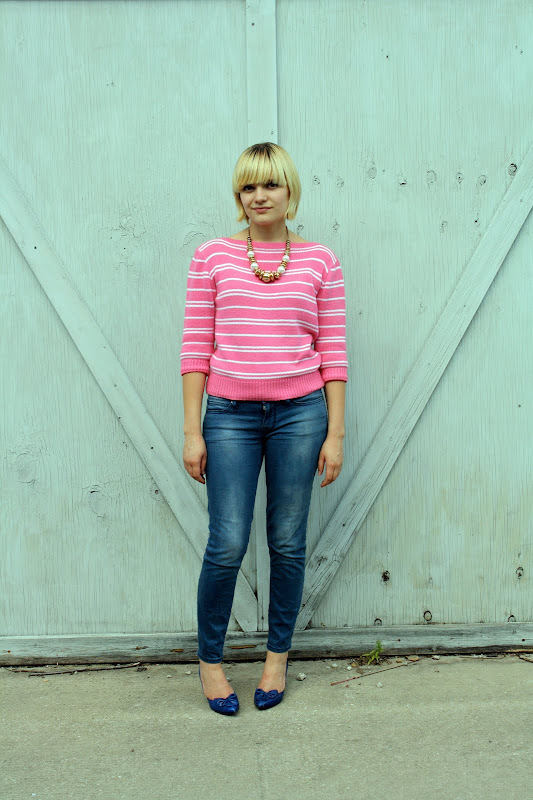 All I walked away with was this striped pink sweater, which I assumed I wouldn't be able to debut till fall. To my delight, this week's mild temperatures allowed me to sport it a couple of times. I wore it with jeans to work and then switched into sassy short shorts for dinner and drinks with friends. As we approach the weekend, I'm definitely feeling the thrifting itch. Hopefully I'll have better luck this time around! Love the sweater! You are so cute. And this weather has been unbelievable, hope it keeps up. cute sweater and i esp. love it with the red shorts! so obsessed with pink/red combo right now! If you ever come to Wichita I'll take you the Salvation Army here. I never walk away empty handed, which means I can't go very often. You may not have found a lot, but you found a gem in that sweater! Its adorable! def loving the sweater with those shorts! looks so cute! I am impress with the sweater. You are so looking so delicate. And this weather has been unbelievable, hope it keeps up. Such a beautiful sweater, looks great with the red shorts. The sweater looks great! Whole attire is just beautiful. This outfit is perfect combinations of colour and design.